In March 2004, I took a risk and in a blog titled "Predictions about the 2004 U.S. Presidential Election" stated that "I expect the U.S. presidential election in 2004 will be a Bush blow-out, reminiscent of 1984." He is the first far-leftist possibly to become the Democratic candidate for U.S. president since George McGovern succeeded at this in 1972. Should Obama be nominated, I expect he will do less badly than McGovern (who won just 17 out of 537 electoral college votes), but he will also do very badly. 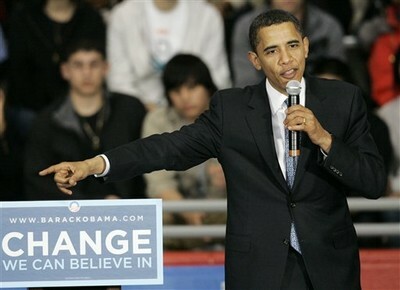 Barack Obama - will he fare as badly as George McGovern? 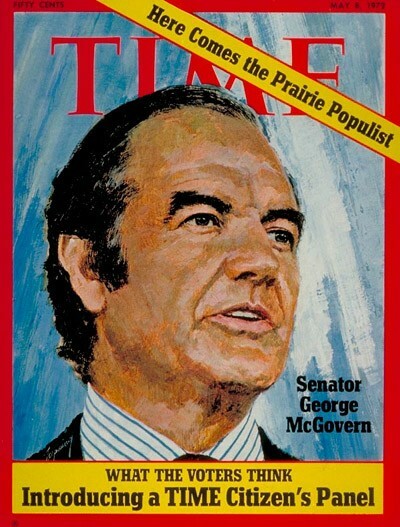 George McGovern generated excitement in his day, 1972.
it appears that, in a year when the Democrats were supposed to make their triumphant re-entry into Presidential politics, we may be witnessing the final demise of the New Deal. The Pennsylvania primary was a clincher. Obama has two constituencies -- African Americans and college-educated liberals. They're both passionate bloc voters and will turn out in droves. But their numbers are limited. They'll give Obama Massachusetts, Rhode Island, Mississippi, Illinois, and maybe California and Oregon, but that will be about it. Nov. 5, 2008 update: Well, this prediction was badly wrong. To explain it away, I could point to the fall's financial problems, the media's bias, or to the McCain campaign's many errors, but there's a deeper issue here. I had confidence that the American people would reject Obama when they learned about his extremist political views, dubious associations, and biographical mysteries. I am astonished that these problems hardly registered, I feel bewildered by my own country, and apprehensive by what comes next. (1) This unexplained reference, in a speech on July 2, 2008: "We cannot continue to rely only on our military in order to achieve the national security objectives that we've set. We've got to have a civilian national security force that's just as powerful, just as strong, just as well funded." What does this mean? According to Lee Cary at American Thinker, "Obama aims to tap into the already active volunteerism of millions of Americans and recruit them to become cogs in a gigantic government machine grinding out his social re-engineering agenda. It's Orwellian-like, with a novice social activist's mentality at the helm." (2) The massive crowds attending Obama; in the Associated Press description, "In Chicago, Obama's hometown, an estimated 125,000 people gathered in unusually warm weather to greet the senator at a delirious victory rally at Grant Park." Fouad Ajami notes the novelty of this phenomenon in American politics: "Hitherto, crowds have not been a prominent feature of American politics. We associate them with the temper of Third World societies." Ajami, a Lebanese immigrant, ominously concludes that "those vast Obama crowds, though, have recalled for me the politics of charisma that wrecked Arab and Muslim societies." Then, to round out this decidedly unusual electoral season, there is the matter of what I call history's largest stink-bomb – the question of Obama's birth in Hawaii and his eligibility to serve as president of the United States. Although the mainstream media has almost unanimously ignored the Philip Berg lawsuit wending its way through the legal system, Obama's reluctance to settle this issue simply by providing the proper documentation makes one wonder if really he can do so. Should he not, the implications are breathtaking.